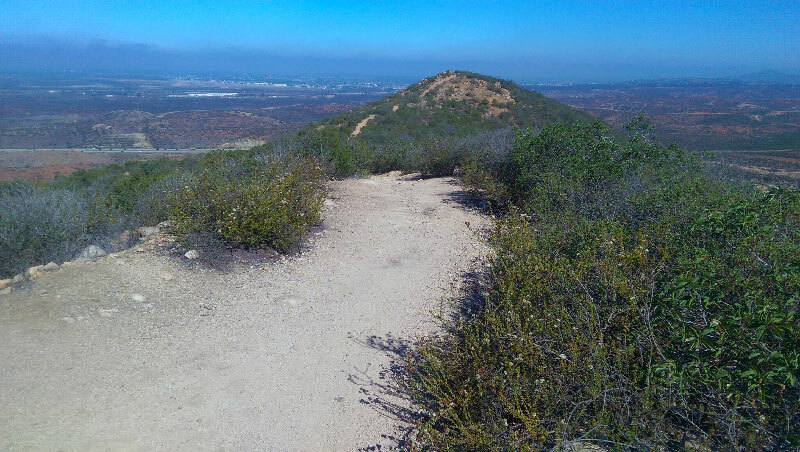 Mission Trails Regional Park is home to five of the highest peaks in the city of San Diego, not to mention some of the most challenging trails. 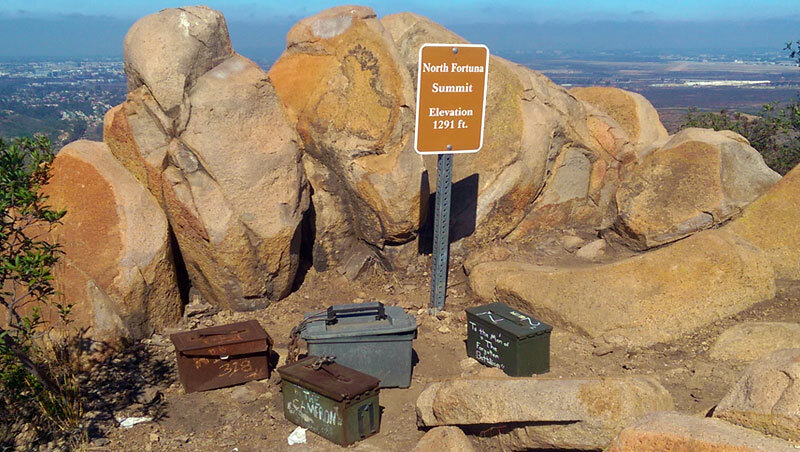 At 1291 ft., North Fortuna Peak is the third highest peak in Mission Trails after Pyles Peak (1371 ft.) and Cowles Mountain (1594 ft.). Just south of the North Fortuna Peak and across Fortuna Saddle Trail stands South Fortuna Peak at 1094 ft.
North and South Fortuna Peaks can be accessed using any one of the many trailheads scattered throughout the park north of Mission Gorge Road. No matter which route you choose you’re looking at a challenging 8.5 – 10 mile round trip hike, so gear up and plan on making a day of it. 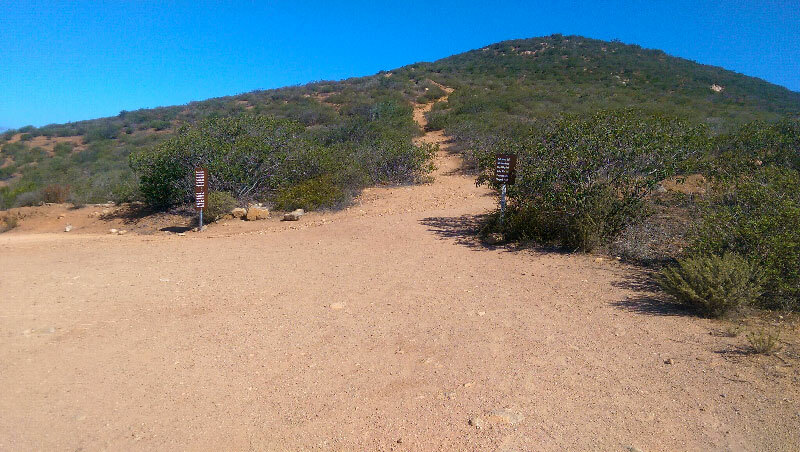 Arguably, the most challenging route to the two peaks is via South Fortuna Trail, which begins where the San Diego River Crossing Trail ends. 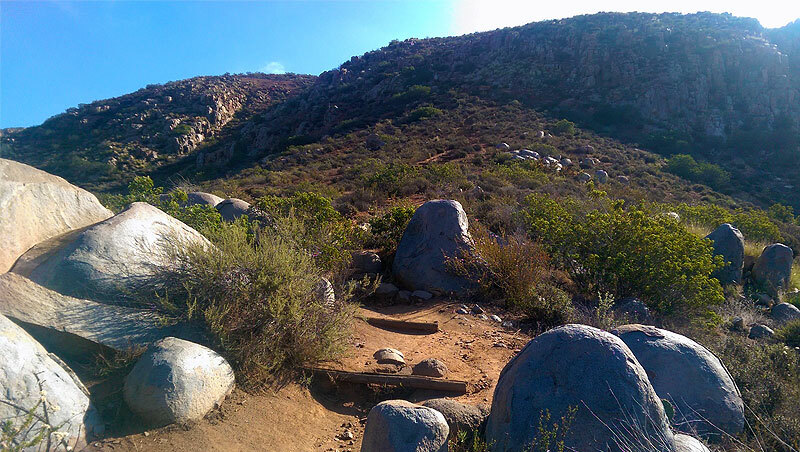 The closest trailhead to South Fortuna Trail has plenty of parking and is located just southwest of the Mission Trails Visitors Center off Mission Gorge Road. 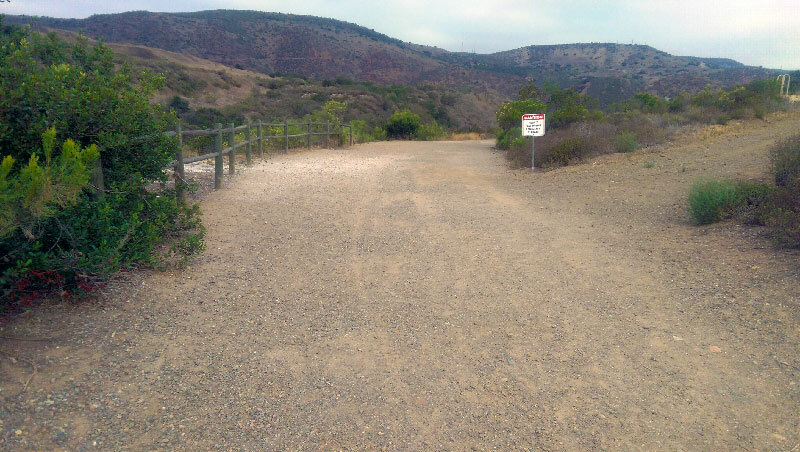 From the trailhead, you’ll follow a short, gravel-strewn dirt road section of the Visitors Center Loop Trail down towards the San Diego River. 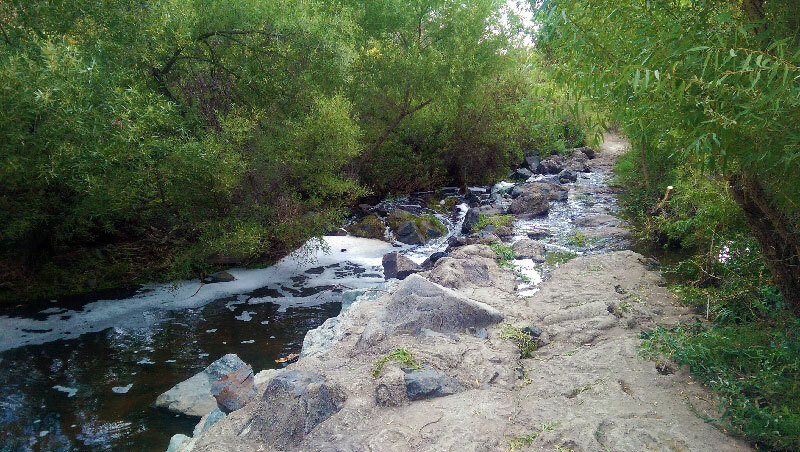 The river level varies dramatically depending on the time of year and rainfall. When we were there in late July, we were pleasantly surprised to find it’s levels were high and the water was flowing freely. 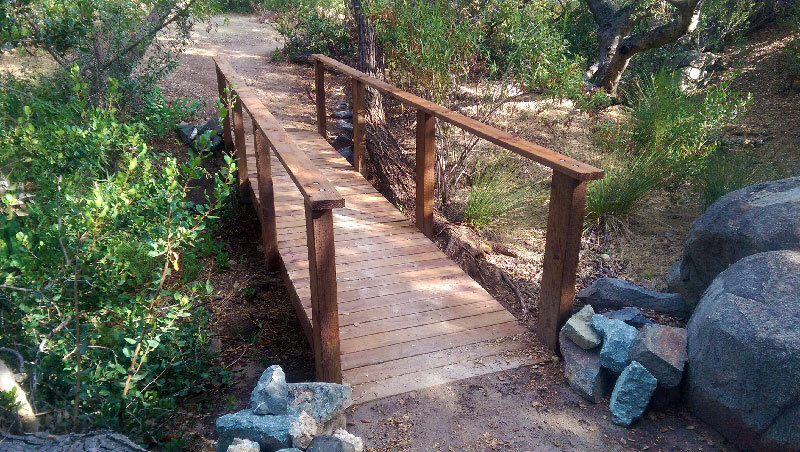 Once you find your way across the river, you’ll follow another dirt road section of the San Diego River Crossing Trail. Just before the road sweeps to the left is a trail junction for South Fortuna Trail. This is where you get your first close up look at the North and South peaks. There’s not much shade, so take advantage. At the bottom of the hill lies the beautifully wooded Suycott Valley. 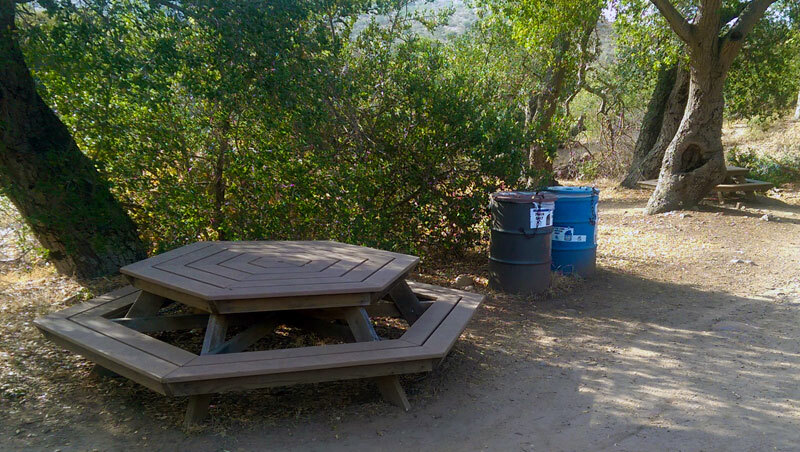 Hidden here among the trees is a quiet, shaded area with two picnic tables where you can rest and refuel for the journey ahead. From the picnic area you have the option of heading north to Fortuna Saddle Trail, which is a direct route to the valley and splits the North and South Fortuna Peaks. 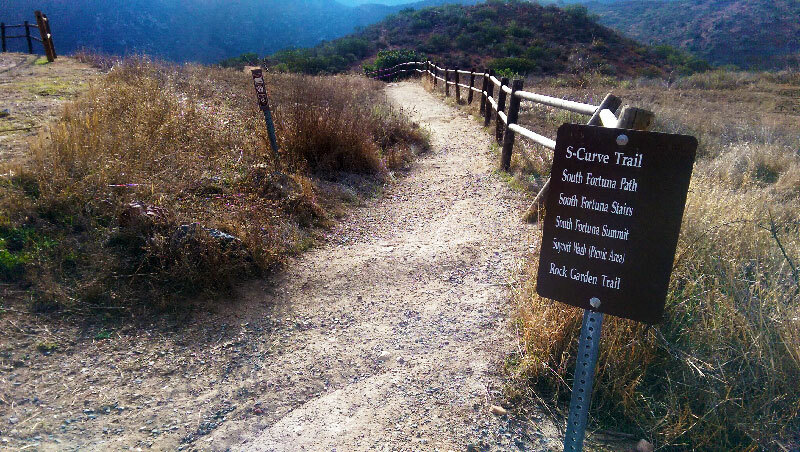 Follow the trail south and you will begin your journey along the South Fortuna Peak Trail. As you emerge from Suycott Valley the path to South Fortuna Peak becomes clear. The side of the hill is so steep here that a series of rustic stairs have been installed to aid hikers in their efforts to summit the peak. 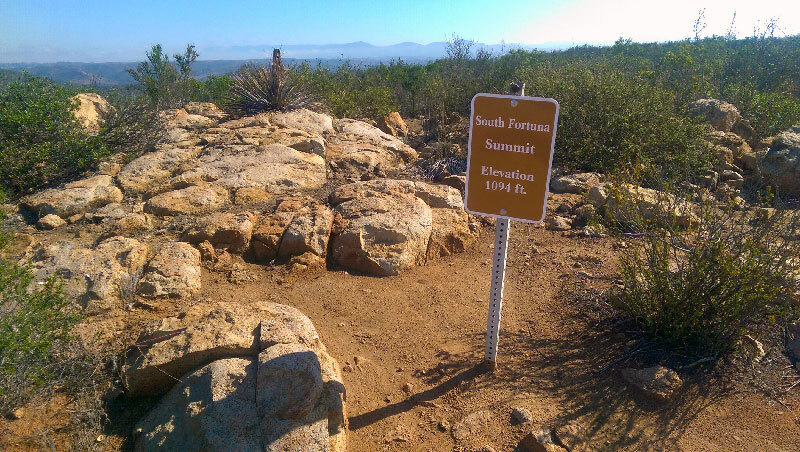 After a brief but arduous ascent, you’ll round the top of the mountain where you can breathe easy as you take in the views from the 1094 ft. summit of South Fortuna Peak. To the South are Kwaay Paay Peak, Pyles Peak and Cowles Mountain Peak, the highest peak in the city of San Diego. And to the north is your last stop along this journey, North Fortuna Peak. 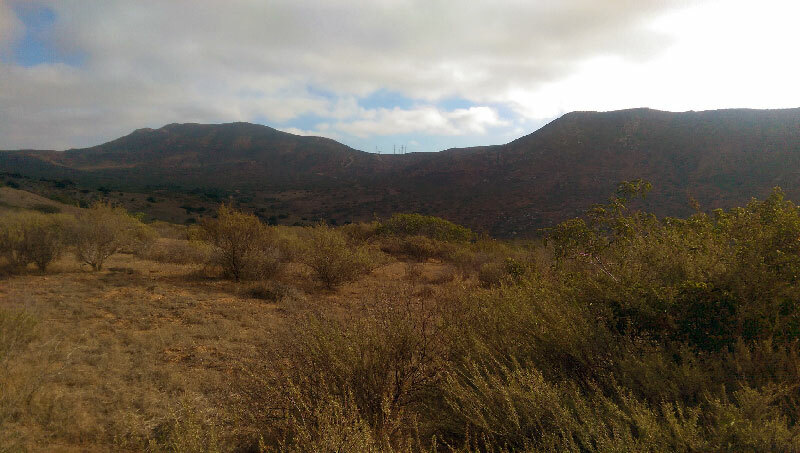 North Fortuna Peak is a short 1 mile hike from the south peak. The first peak you reach is a false summit, don’t be fooled by it. 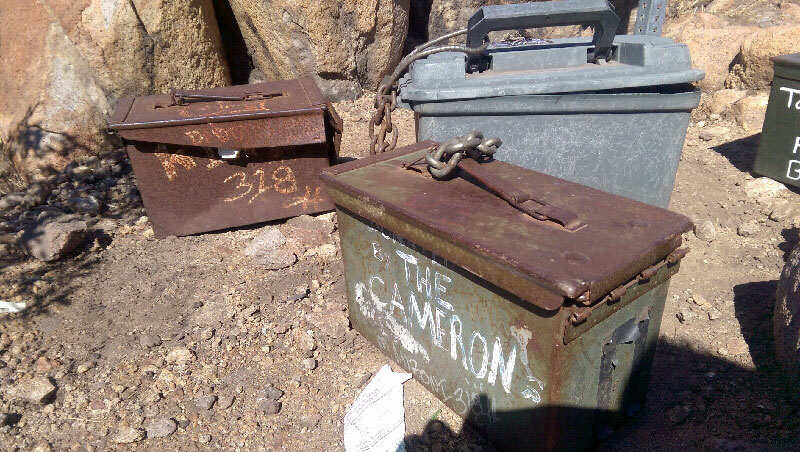 Continue along the trail for another couple hundred yards and you’ll know you’ve arrived at the summit when you reach the summit marker and some ammo cans. Open a can, take a pen or pencil, write a note and pat yourself on the back. 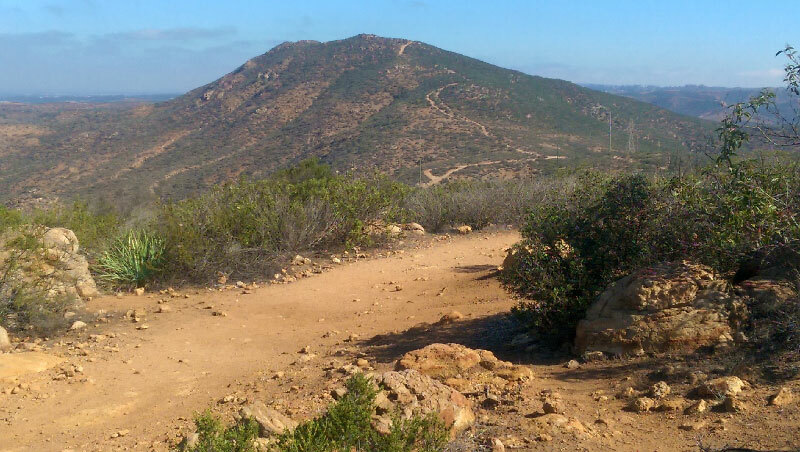 You’ve conquered two of San Diego’s highest peaks in one day. The options for getting back to your car are just as plentiful as the options leading to the point where you’re standing. 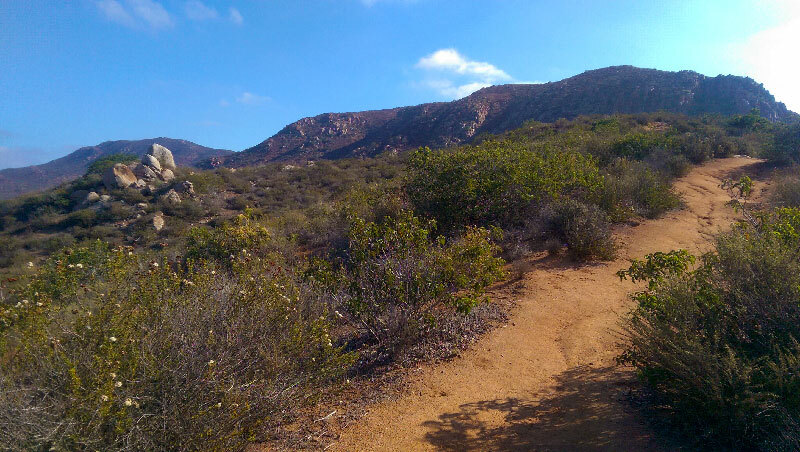 You can head back the way you came, or you can extend the journey or change the scenery by continuing along the North Fortuna Trail to the North Perimeter Trail or taking the Fortuna Saddle Trail in either direction. I loved this hike. We headed out at around 7:30 on a warm Friday morning in July, which was the perfect time for this hike. It didn’t really start getting hot until after we had summited both peaks and headed back down the mountain. 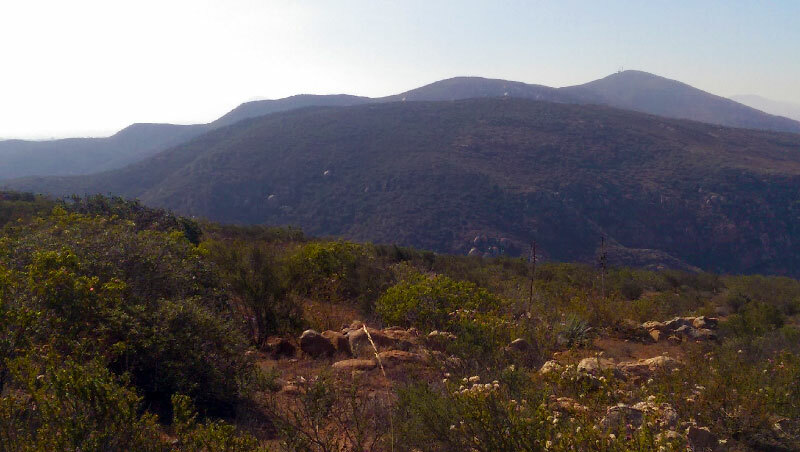 The views of the park and surrounding mountains while hiking are constantly changing, almost as much as the terrain and plant life along the trail. 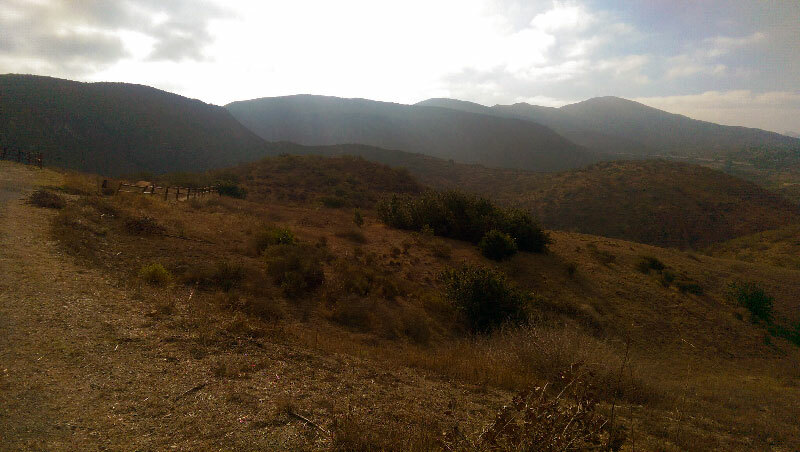 The trail winds up and down across hills and valleys giving you a good mix of challenging hills and relaxing nature hikes. And once you reach the summit, you can’t help but be amazed by the views in any direction you look. Of particular note are the three southern peaks of the park standing tall in the distance, encouraging the adventurous to continue the journey.